Miss Adventure Falls is a family style raft ride being at Disney’s Typhoon Lagoon. Each raft can hold from 2-4 people. The ride features a lift hill that brings guests past an animatronic parrot. Miss Fortune Falls will be a family-style raft attraction that takes guests on a splashing journey through the fabled Captain Mary Oceanear’s past. Legend has it that Captain Oceanear, a treasure-hunting heroine, travelled across the sea collecting unique artifacts before she became stranded at Typhoon Lagoon many years ago by a rogue storm. On January 10th, 2017 Disney released a new piece of concept art for the (officially) renamed ride. 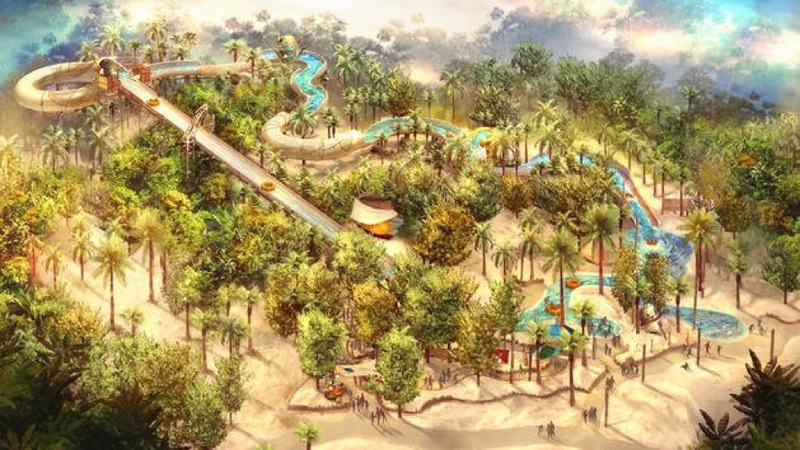 The upcoming attraction at Disney’s Typhoon Lagoon is getting a new name. Miss Fortune Falls is a family raft ride that will debut in Spring 2017 at Disney’s Typhoon Lagoon.